This recipe holds a special place in my heart, it was the first time I really tried a more complicated pastry at home and these doughnuts are AMAZING. I love cake doughnuts and while I've tried yeast-based doughnuts at home, I have to say I'm definitely more of a cake doughnut person, plus they stay fresh much longer than their yeast-based counterparts. I usually make this recipe in the fall to coincide with apple cider season, but you can really get apples and cider year-round these days so there's no reason to wait! If you can't get your hands on cider, just use apple juice and reduce it down a little on top of the stove with some of your favorite warming spices. Core and coarsely chop the apples (leave the peels on!) and combine them with 1 1/2 cups of cider in a medium saucepan over medium heat. Cover and cook until softened (about 8-10 minutes), then uncover and cook until apples are tender and the cider is almost completely reduced (about 8 more minutes). Use an immersion blender or transfer the mixture to a standard blender and puree until smooth. You should have about 1 cup of sauce. Let it cool slightly. Whisk the flour, baking powder, baking soda, 1 1/2 tsp. of cinnamon, salt and nutmeg into a medium bowl. Beat 2/3 cup granulated sugar with the shortening until it creates a sandy texture, then add in the egg and yolk. Once combined start mixing in the applesauce and beat in half of the dry flour mixture. Next add the buttermilk and vanilla and finish with the rest of the dry flour mixture. Mix until it forms a very sticky dough. Don't overmix or the doughnuts will become tough. Scrape the dough out onto a lightly floured sheet of parchment paper and pat it into a 7x11 rectangle, about 1/2 an inch thick. Cover with another sheet of paper or plastic wrap and refrigerate at least 2 hours. While the dough is chilling you can make the glaze. Simmer the remaining cup of cider in a small saucepan over medium heat until it reduces to about 1/4 cup. Whisk in the confectioner's sugar until the glaze is glossy, and then set it aside. In a separate bowl, mix the remaining cup of granulated sugar and 2 tsp. of cinnamon and set aside for topping. Heat 2 inches of vegetable oil in a large heavy-bottomed pot over medium-high heat until a deep fry thermometer reads 350 degrees. Line a baking sheet with paper towels, and then cut the dough into 12 rounds. I realized we don't have a biscuit cutter, so I just used a drinking glass, then carved out the little doughnut holes with a paring knife. In order to make 12 doughnuts, you'll need to re-work and re-roll out your dough two or three times, just like you would if you were cutting out cookies. You are now ready to fry your doughnuts! Gently place 3 doughnuts at a time (depending on the size of your pot) into the oil. Be very careful not to splatter your fingers with oil! I used a spatula to lower and turn the doughnuts in the oil. The doughnuts fry up very quickly - about 2 minutes per side. Transfer them to the paper towels to drain once they are cooked. I also fried up some doughnut holes - can't waste those and they're so easy to eat! 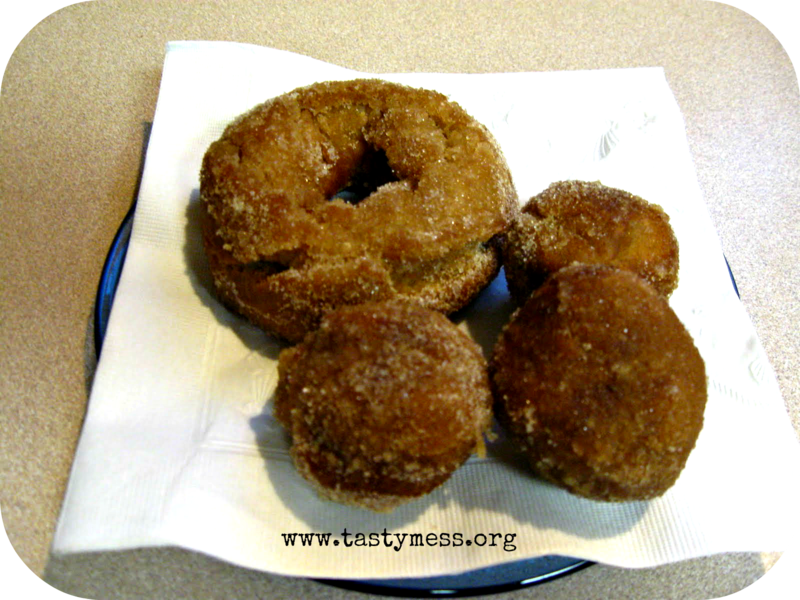 Ok, your last step is to dip each side of the doughnut in your glaze, then toss them in the cinnamon sugar. Place them on a CLEAN paper-toweled baking sheet to set (about 5 minutes or so), then enjoy! They are amazing warm and cold...and dangerously addicting, so look out! The recipe makes a dozen doughnuts and I got about 16 doughnut holes out of the dough.